The latest revelations from Volkswagen, this time involving “irregularities” in the levels of carbon dioxide emitted by 800,000 of its cars, have seen its shares slump once more. They closed down 9.5% at €100.45 , wiping nearly €5bn off its market value today. This is more than twice as much as the €2bn as it admitted the new problem would cost it. Since the crisis began VW has lost nearly €30bn of value. VW’s slide helped push Germany’s Dax down nearly 1% by the close on a day when most other European markets edged higher. However some of the shine came off markets after an opening fall on Wall Street. Stronger than expected US data – the ADP montly employment report showed more jobs were added than expected ahead of Friday’s key non-farm payrolls numbers – along with comments from Federal Reserve chair Janet Yellen that an interest rate hike was a live possibility in December pushed American shares lower. On Wall Street, the Dow Jones Industrial Average is currently down 52 points or 0.29%. On that note, it’s time to close up for the evening. Thanks for all your comments, and we’ll be back tomorrow. The stop-sale order follows a notice by the U.S. Environmental Protection Agency that VW group brands had installed illegal devices on some 3.0 V6 diesel models. VW and Audi dealers were ordered to stop selling new 2015-2016 models with the 3.0 V6 TDI, including the VW Touareg and the Audi A6, A7, A8, Q5 and Q7. VW said pre-owned models from 2013-2014 are included in stop-sale order to dealer. Moody’s has downgraded VW’s credit rating to A3 from A2 with a negative outlook following the latest irregularities. Today’s downgrade reflects mounting risks to Volkswagen’s reputation and future earnings following its announcement on 3 November regarding irregularities in CO2 and fuel consumption levels for certain Volkswagen group vehicles, as well as fresh allegations from the US EPA on 2 November that defeat devices were also installed in certain Audi, Porsche and Volkswagen Touareg models in the US,. These new claims pose further challenges to Volkswagen’s financial flexibility and competitive position, and heighten Moody’s concerns about Volkswagen’s internal control and governance issues, thus further weakening its rating profile. 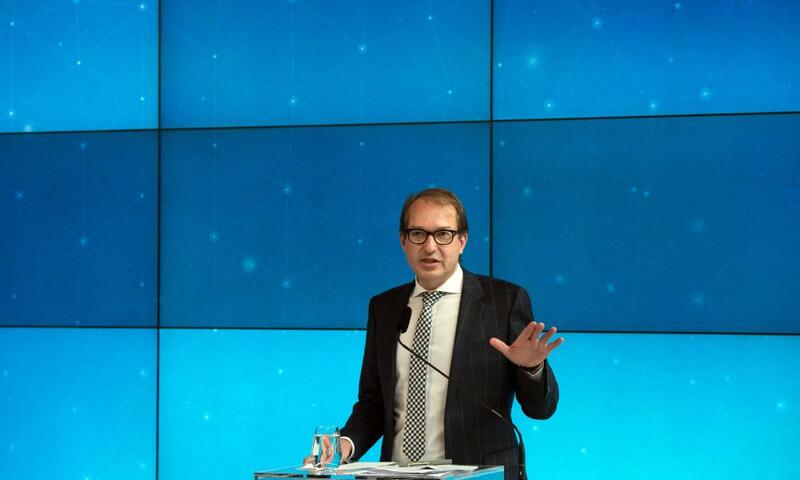 German transport minister Dobrindt says a total of 200,000 cars with the wrong CO2 emissions data could be on the country’s roads, and for these vehicles the car tax may need to be adjusted. He said there would be checks on VW, Audi, Seat and Skoda brands. Earlier he said 98,000 of these could be cars with petrol engines. In total VW has said 800,000 cars could be affected by this latest development in the emissions scandal engulfing the company. 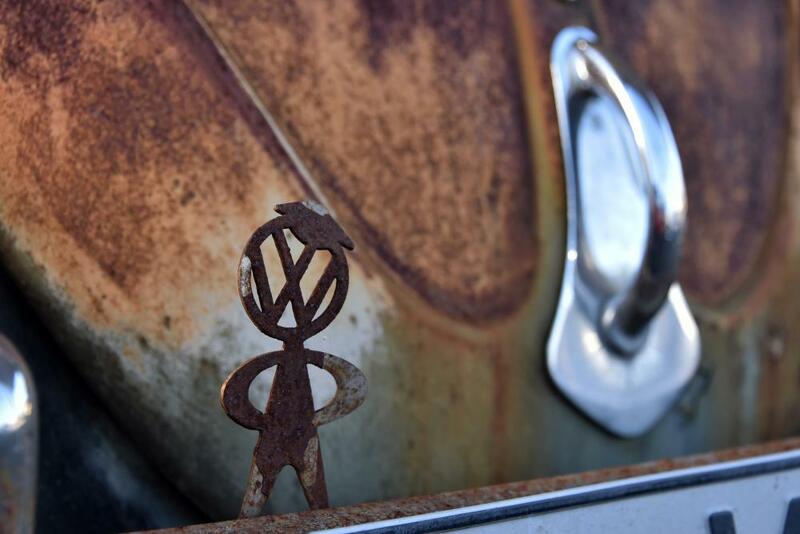 We are pressing VW to provide urgent clarity on the situation. The government takes the unacceptable actions of Volkswagen extremely seriously. This development underlines the importance of the government’s ongoing investigation to establish the extent to which defeat devices have been used. Markets for complex products like cars run on trust – there is a huge imbalance of expertise between the engineers who build cars and the people who buy them. Consumers trust companies like VW to give them the best deal. That is why people buy their products. If this trust breaks down, customers could start see the organisation as untrustworthy. The market for VWs could easily turn into what economists call ‘a market for lemons’ – that is a marketplace where there are huge imbalances of information and customers are routinely suspicious of what sellers have on offer. This suspicion is likely to spread to other brands as consumers start to treat technical details as reliable as the fanciful car advertisements seen on television: they might make us feel good, but they don’t describe reality. The problem with calls for transparency is that Volkswagen has built a culture for decades which has encouraged a lack of transparency. Building a culture of transparency is going to take time. It will be under pressure to overhaul its corporate governance system, but establishing effective oversight is unlikely to be enough. What is needed is effective undersight – giving lower level employees the chance to speak up if something goes wrong again in the future. Today we were told that among the affected vehicles are 98.000 petrol vehicles. VW said late on Tuesday that it had understated the level of carbon dioxide emissions in up to 800,000 cars sold in Europe. German transport minister Dobrindt calls VW manipulation unacceptable, orders new engine tests. 1) Volkswagen could be forced to pay billions of pounds to European governments in tax credits after admitting it had found “irregularities” in the levels of carbon dioxide emitted by 800,000 of its cars. Analysts believe VW will be hit with the bill, because drivers enjoyed unfairly low car duty rates based on CO2 test statistics. 2) Lawyers have warned that customers are already suffering from the crisis, which has forced down the resale cost of their vehicles. VW owners could also face unexpectedly higher costs in the future, if their cars are rerated at a higher emissions level. 3) Angela Merkel’s office has urged VW’s management to clear the scandal up, and provide the transparency it promised. Economy minister Sigmar Gabriel has offered the embattled auto firm some support, though, saying it deserved credit for reporting the CO2 problems. 4) Shares in VW have slumped on the Frankfurt stock market today, currently down almost 9%. That wipes around €5bn off the company’s market capitalisation. VW has lost more than one-third of its value since the scandal broke in mid-September. 5) Analysts have warned that the crisis could still escalate. Exane BNP Paribas fears that VW could suffer a “harsher commercial impact”, now it has admitted problems with fuel efficiency figures. And Ipek Ozkardeskaya, analyst at London Capital Group, says Germany’s image has also been badly damaged by the scandal. The Volkswagen scandal has reached India. The Delhi government has issued a notice to the carmaker today, after finding “significant variations” in the German carmaker’s diesel car emissions. The government has asked Volkswagen to respond to the notice in 30 days, Ambuj Sharma, additional secretary in the ministry of heavy industries, said. Volkswagen could face fines or recall if the company is found guilty of violating the emission norms. 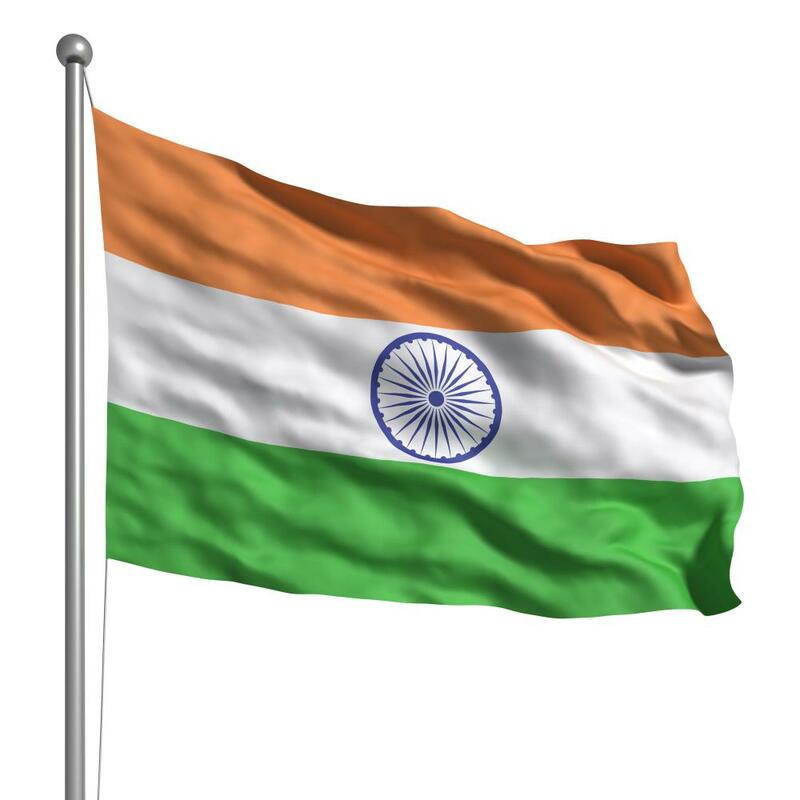 Volkswagen’s India unit said in a statement it had received a notice from Automotive Research Association of India (ARAI), the country’s testing agency, and would submit its response by November 30. This relates to the first phase of the scandal, involving diesel vehicles emitting excessive NOx gases, rather than the new problems around CO2 and fuel efficiency. German Chancellor Angela Merkel’s spokesman has weighed in, urging Volkswagen to clear the scandal up. Steffen Seibert pointedly told reporters that VW must deliver on its pledge to explain exactly what has happened, and fix it. Seibert said the government still stood by Merkel’s earlier statement that the scandal would not inflict lasting damage on the reputation of Germany industry. “The scope for brand damage is greater now. I don’t think most European consumers are particularly bothered about emissions but when it starts to affect fuel economy people start to take notice. Volkswagen could be forced to compensate customers if it transpires that their vehicles have burned through more fuel than promised. That would be on top of any compensation handed to governments because VW cars incurred too little tax. Volkswagen has said the “economic risks” are €2bn (£1.4bn). This works out as €2,500 per car, far more than the €609 per car put aside for the cost of the 11m cars involved in the diesel emissions scandal. Analysts believe these costs relates to the amount VW will have to pay back to governments in tax credits. CO2 emissions are used to set the road duty that vehicles are eligible for, so rigging the tests would mean VW vehicles contributed less in tax than they should have. However, this may only be the start of the costs. VW may have to compensate owners upset that their car consumes more fuel than they thought. The latest revelation could also have a more damaging impact on the brand than the diesel emissions scandal, because it directly relates to the performance of the vehicle. Related: Q&A: what are the new revelations about VW? Breaking away from Volkswagen briefly, construction machinery giant JCB has joined the ranks of manufacturing companies announcing UK job cuts. The diggers and excavators firm warned that 290 positions could be lost across its 11 plants, due to a “rapid deterioration” in global construction equipment markets. It’s on top of 400 layoffs already planned. This comes a day after Michelin announced 860 job cuts in Northern Ireland, and on top of thousands of job cuts in the steel industry. Volkswagen drivers are already being hit in the pocket by the emissions scandal even before these latest problems, according to UK law firm Leigh Day. “Volkswagen have provided very little information about what they intend to do to repair the problem, leaving their customers in limbo whilst the value of their vehicle depreciates. “We have already had reports of clients who have sold their vehicle for less than they were worth before the scandal broke and those who are currently trying to sell their vehicles and are being offered sums that are below the pre-scandal book price. “The announcement that the CO2 emission and fuel consumption levels may have been manipulated in both petrol and diesel cars will spell further trouble for UK consumers, particularly as vehicle excise duty is calculated based on either engine size or fuel type and CO2 emissions. Leigh Day are already representing over 7000 Volkswagen customers who are seeking compensation after it admitted installing software on 11 million cars to fool emissions tests. Nicolas Ziegelasch, head of equity research at stockbrokers Killik & Co, argues strongly against investing in Volkswagen right now. As official fuel consumption figures were also set too low, there is risk of backlash from consumers, and current owners may well claim damages. The group estimates the economic impact at €2bn. With the continued uncertainty around these issues and the potential long-term cost, we believe that VW remains uninvestable and that the issue is likely to spread across the industry. Volkswagen still enjoys the support of Germany’s economy minister, who has just thrown his support behind the company. 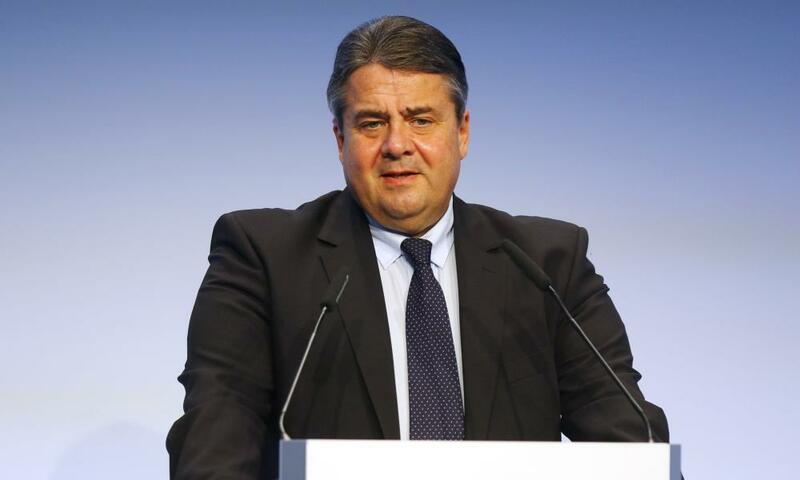 Speaking in Berlin, Sigmar Gabriel argued that VW should get credit for reporting these problems with CO2 emissions and fuel efficiency levels itself. Up to a point, I’d suggest. Regulators across the globe are kicking the tires of VW models, so any problems will surely come to light eventually. VW didn’t really have much choice…. Volkswagen couldn’t have picked a worse time to admit it might have cheated CO2 tests. 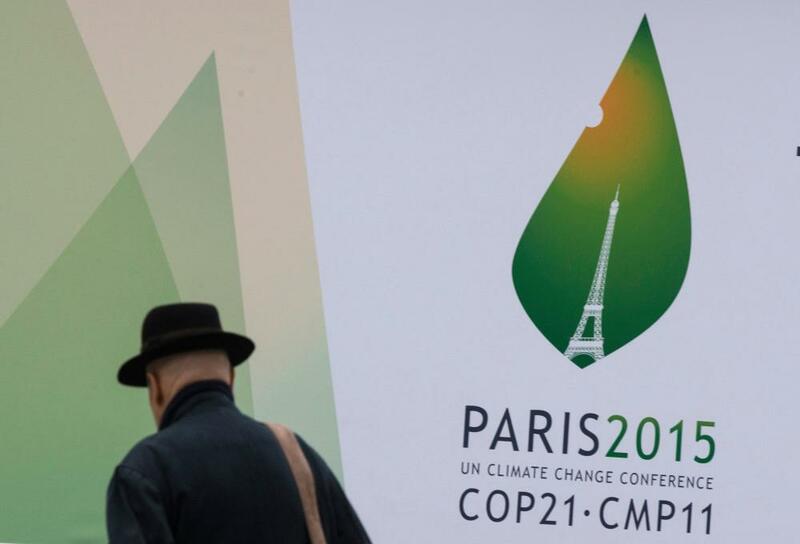 At the end of the month, world leaders including Barack Obama, Xi Jinping, David Cameron and Narendra Modi will join a summit in Paris to ‘save the world’ from dangerous global warming. Central to any deal is cutting carbon emissions, so the news that 800,000 cars have potentially emitted more carbon will be as welcome as a coal company at the talks. Only yesterday, the UN’s top climate change official said the VW emissions scandal was a blessing in disguise because it’d hasten the switch to lower carbon vehicles. She might take a different view this morning, now the affair has spread to CO2 too. Ipek Ozkardeskaya, analyst at London Capital Group, says investors have “retreated to the side-lines” to wait for the thunderstorm over VW to calm down. The image of German precision, strength, security and reliance are equally damaged. At this stage, it is very difficult to value the goodwill of Volkswagen. Shares in France’s largest carmakers, Renault and Peugeot, both fell around 1%. The glass may well be half-full for VW competitors, as they certainly have a good market share to grasp as a significant number of VW consumers will likely walk away from VW galleries. At least for the next couple of years. Analysts at UBS reckon this scandal could cost Volkswagen as much as €35bn – or two-thirds of its current market value. We continue to appreciate the speed and thoroughness demonstrated by new CEO Matthias Műller in dealing with these issues, and have estimated product fixing costs as high as €10bn in addition to litigation and fines (for a total €35bn). This development will however certainly add to pressure on VW shares and on-going concerns about costs as well as ethics and governance at the group level. (2) our liquidity analysis suggests the group can cope with a €35bn outflow over 5+ years without needing to raise capital. Exane BNP Paribas have also created a Q&A on the Volkswagen scandal. Do we know which cars in which regions are affected? No. All VW has said is that it is ‘mainly’ diesel cars that are affected (implying some gasoline also). We do not yet know which regions, brand or models are affected, but given the CO2 type approval nature of the issue, we suspect the bulk of the affected vehicles will be in Europe. Are these cars a subset of the 11m cars affected by the prior NOx issue? This is not clear. However given some vehicles appear to have been gasoline models, they are by definition NOT part of the same 11m recall on NOx that originally sparked the crisis. However a large portion of the 800k CO2 affected cars may well be part of the 11m. Any overlap may help reduce total customer compensation costs. How much did top management know about all this? We may never know. VW has denied that senior management knew of the issue, and outgoing CEO Winterkorn explicitly denied any wrongdoing in his resignation statement. VW has pointed towards a small number of individuals being involved and responsible for developing the ‘defeat device’ strategy. However press reports are full of speculation of more broad based knowledge of the issue, pointing to warnings from supplier Bosch many years before the scandal broke. However these reports are all unverified, and thus far NO EVIDENCE of any wrongdoing by top management has been discovered (to the best of our knowledge). Could VW’s new CEO, Matthias Mueller, be at risk? Possibly. While Mueller, as former Porsche CEO, is unlikely to have been caught up in the diesel defeat device issue, his handling of the crisis will no doubt come under close scrutiny. The continued lack of information is a considerable frustration to investors, even if VW’s unwillingness to disclose ‘too much’ is understandable given the legal sensitivity around the case. The deepening crisis at Volkswagen could have a significant impact on future sales, believes Exane BNP Paribas analyst Stuart Pearson. Pearson has also hiked his estimated cost of the scandal, in a research note to clients. VW’s share of the European market did fall slightly in September, as the diesel emissions scandal broke. VW’s woes are weighing on the German stock market. Shares in rival carmakers BMW and Daimler are both down this morning, along with tire maker Continental. More than €4bn has been wiped off Volkswagen’s market capitalisation this morning – which is twice the estimated ‘economic risk’ of these latest revelations. VW shares have scrambled back slightly, but are still deep in the red, down around 7.5%. The cost of insuring VW’s corporate debt against default has risen this morning. That’s never a good sign for a company, but it’s still below the peak reached in mid-September when the scandal first broke. The ‘irregularities’ which Volkswagen has discovered around carbon dioxide emissions could have serious tax implications. In Britain, car vehicle tax rates are based on either engine size or fuel type and CO2 emissions. So potentially, VW drivers may have benefitted from unduly low rates — at the taxman’s expense. That’s just conjecture at this stage – VW haven’t yet said where these cars were sold. In Ireland car tax is based on CO2 emissions. If VW have been lying about them, maybe the Irish gov. should go after VW for back-tax. Shares in Volkswagen dropped as much as 10% on Wednesday after fresh admissions from the carmaker that it had also overstated fuel-consumption claims and would take a further financial blow of €2bn ($2.2bn). By 0816 GMT, the shares were trading down 8.8% at €101.20. Since VW admitted on Sept. 18 it had cheated diesel-emissions tests in the United States, €24bn have been wiped off its market value. 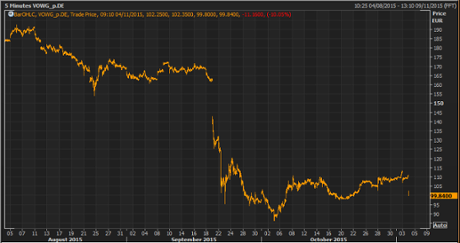 VW’s shares have hit a two week low this morning: (sorry, I forgot they dipped below €98 in mid-October). The big plunge came in mid-September, when US regulators broke the news that VW had been cheating on emissions tests. Volkswagen shares have tumbled by nearly 10% at the start of trading in Frankfurt. 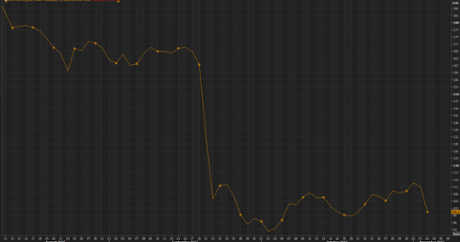 They have plunged €11 to hit €99.95, a one-month low . 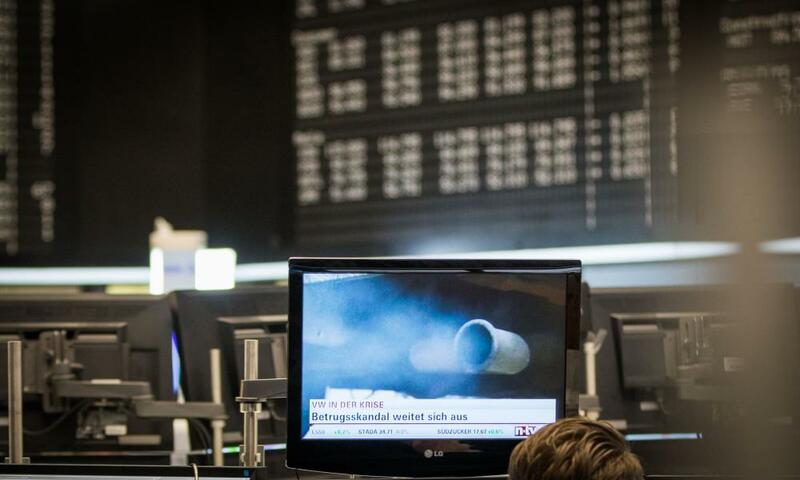 Traders are rushing to sell the stock, following last night’s admission of “irregularities” in the carbon dioxide levels emitted by 800,000 of its cars. The news that it could include petrol cars is also spooking investors. #VW scandal widens to petrol engine models. Additional 800K may be involved in emission scandal. uh oh. 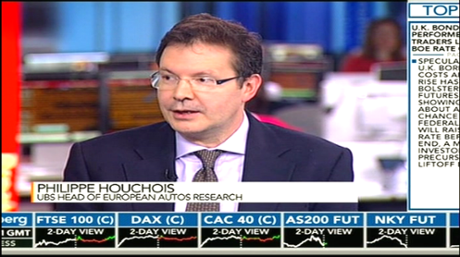 The head of UBS’s automobile team, Philippe Houchois, says the crisis at Volkswagen has taken a serious turn. You can filter out NOx, but you can’t filter out CO2, so it’s potentially a bigger issue. And that’s because CO2 emissions levels are directly linked to the fuel economy of a vehicle. If a car burns through more gas than officially estimated, it will pump more CO2 out as well. Analysts at Credit Suisse believe that these new revelations around carbon dioxide emissions levels could be more serious for VW than the known problems with NOx levels. At this point the financial impact from today’s release is unclear, as only limited details have been provided. However, given that that provisions per vehicle are 4.1x higher versus the NOx issue, the magnitude could be much bigger in scale. I suspect it depends whether VW have got to the bottom of the problem yet. Currently, they says the CO2 problems (estimated cost: €2bn) only affect 800,000 vehicles, compared to the 11 million which contain software to cheat NOx tests (estimated cost: €6.7bn). The steady stream of bad news from Volkswagen in the last six weeks has stunned some commentators. 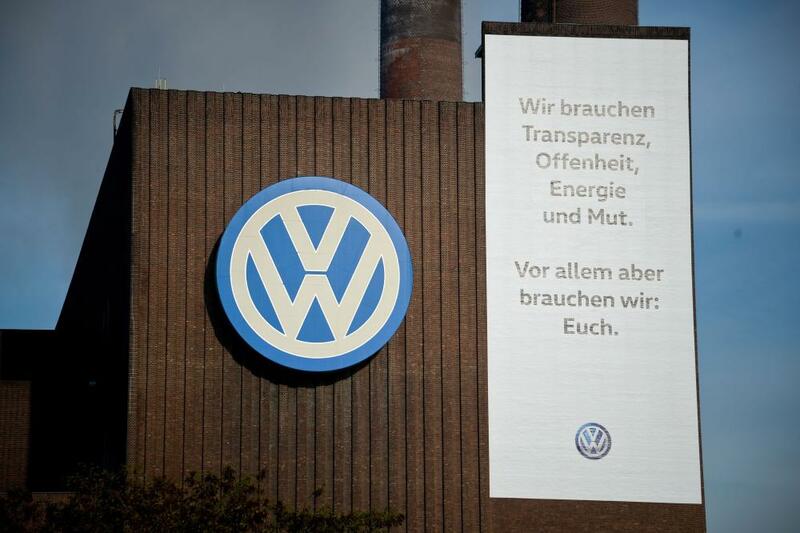 “VW is leaving us all speechless”. Volkswagen’s Polo, Golf and Passat models are affected as well as the subcompact A1 and the A3 hatchback at the Audi premium brand, a Volkswagen spokesman said by phone. The affected models at other brands include the Skoda Octavia, the Seat Ibiza and the Seat Leon. Volkswagen shares have slumped by over 6% in pre-market trading on the German stock market, as Frankfurt traders digest last night’s news. The market opens at 9am local time, or 8am GMT. The company told the Financial Times that the vehicles affected were “mostly diesels”, although for the first time petrol engines were involved in the scandal. The vehicles’ emissions were understated and fuel economy overstated. The vehicles’ emissions were understated and fuel economy overstated. The vehicles all have 1.4 litre engines — they are mostly VW Polos and Golfs but some are also Audi, Seat and Skoda cars. The crisis at Volkswagen is deepening today, after the German carmaker admitted that even more of its cars had “irregularities” in their emissions levels and fuel consumption figures. For the first time, VW said it had found problems involving carbon dioxide emissions on 800,000 of its vehicles – on top of the 11 million that have been spewing out unacceptably high levels of nitrogen oxides. An internal investigation into the diesel emissions scandal has discovered that CO2 and fuel consumption were also “set too low during the CO2 certification process”, the company admitted on Tuesday night. The dramatic admission raises the prospect that VW not only cheated on diesel emissions tests but CO2 and fuel consumption too. VW said it estimated the “economic risks” of the latest discovery at €2bn (£1.42bn). The company said the “majority” of cars involved have a diesel engine, which implies that petrol cars are involved in the scandal for the first time. These revelations pile more pressure on VW’s management, as new CEO Matthias Müller tries to get to grips with exactly what’s gone wrong at Germany’s largest carmaker. Stay tuned for the latest developments. The global service sector will be in the spotlight this morning, as Markit publishes its latest PMI surveys. And in the eurozone, ECB chief Mario Draghi is giving a speech at the ECB Forum on Banking Supervision in Frankfurt, Germany. He could drop new hints about the need for fresh stimulus measures to get Europe’s economy moving.